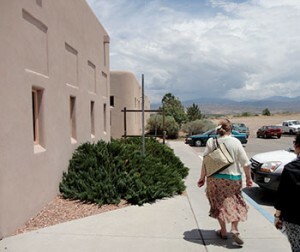 3 Full-time, including Director Jill Conner, and 1 part-time staff member. No volunteers at this time. In one form or another, it has been operational for about 15 years, and the library moved to current location about 10 years ago. 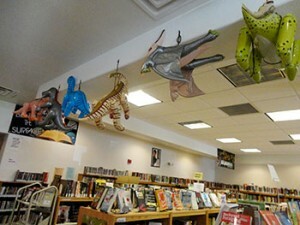 Summer reading prizes make great decorations. “People adore the Summer Reading Program and it keeps us going all summer,” says Jill – and it is their most popular program in general. The most attended single program, however, was put on by Exotics of the Rainforest. They showed up with all sorts of birds that flew around, and a giant lizard – they let a kid hold it and it was about as big as he was! Over 90 patrons came to that one event. The first great challenge was getting the current library up and running. When Jill arrived, ¾ of the library was un-cataloged and unorganized. 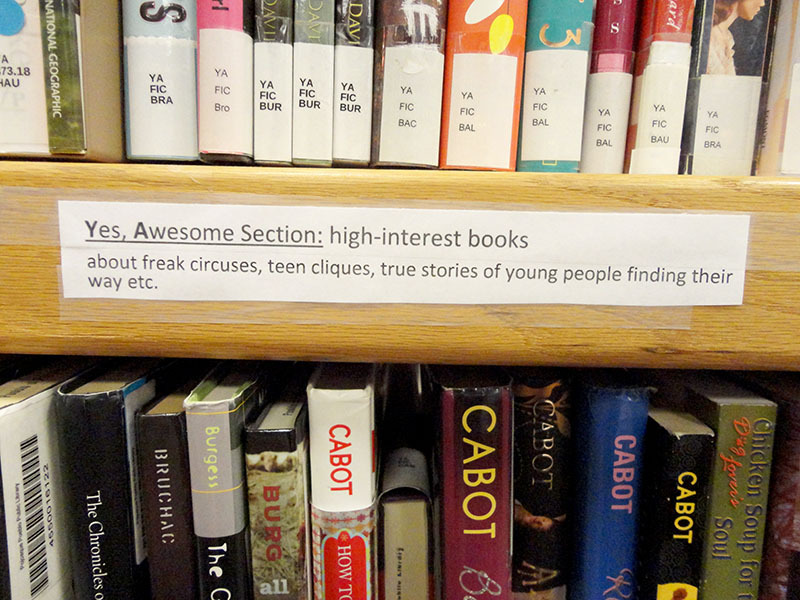 There was no automated circulation in place, no due dates – patrons signed a sheet to check out books. Aisles were non-existent. 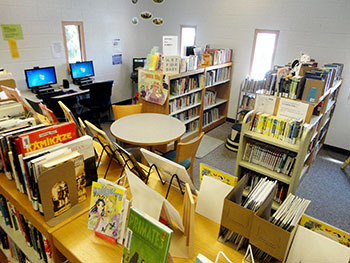 With diligence and elbow grease, the library is now fully up and running, with books and DVD’s neatly shelved and organized, and staff scanning patron and item barcodes on check in/out. Nowadays, space is the greatest challenge facing Pojoaque Public Library. A collection of 16,000 volumes is deftly packed into 2,000 square feet. Programs sometimes bring in over 90 people. 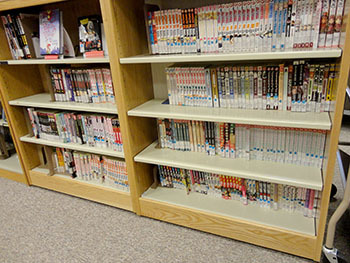 90 patrons, 16,000 volumes, 2,000 square feet – you do the math! Plans for a new building fell through with the economic downturn. But Jill is a solutions-oriented librarian. If she can’t build a new building, she can find alternative ways to continue to bring quality library service – and more materials – to her patrons. So, Jill is working on having digital books play more prominence in the future of her collection. With open houses scheduled around lunch hour, Jill brings in patrons to come try out a petting zoo selection of electronics or to work with them one-on-one with their own eReaders. This led to an interesting discussion between Jill and I…and digression from challenges to more on solutions. She has a fantastic idea to market her eReader open houses – and to play off the holiday season. With her petting zoo out, she invites patrons to come try out the different models of Kindles they might want to gift for Christmas. After the holidays, she plans to follow this up with more open house programs, where patrons who received an eReader as a gift can bring them in, be trained on their use, and learn how to download library books onto them. “Fantastic!” I thought. 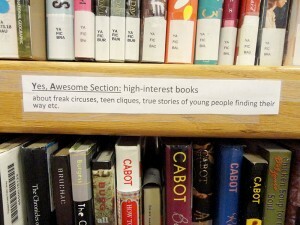 “YA= Yes, Awesome!” Jill notes that YA materials have been a good way to hook reluctant adult readers. 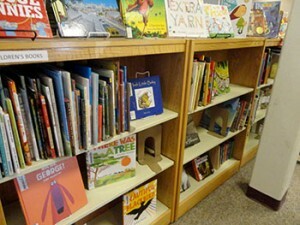 Many libraries have mentioned how their space becomes a ghost town around the holidays, and her programming was connecting holiday shopping to literacy promotion — and bringing patrons in. Night Film by Marisha Pessl (sounds very interactive and modern) and The Lost City of Z: A Tale of Deadly Obsession in the Amazon by David Grann (nonfiction). “The parents stood by mortified!” Jill said, as the little kid would not let go of his librarian! And summer reading brings all sorts of highlights to mind. At the end of the summer, Pojoaque Public Library has two pools of prizes – one based on the most books read, and one for all kids who completed the program to enter in a drawing. Jill relates that it is just so great to see kids’ faces light up, and the way the drawing encourages budding readers to keep going. “Right after the prize drawing, one kid asked to sign up for the next summer reading program, right away!” said Jill. How excited and inspired that kid must have been. When she began, she started with only one directive from her supervisor — “We want this to be a real public library.” Additionally, Jill wants the library to be up-to-date — the cool place to go, with what’s in book stores and beyond…to be filled with current, new things, all the trends. She sees the library as an opportunity to bring the world to community of Pojoaque, beyond traditional reading materials and basic information sources. 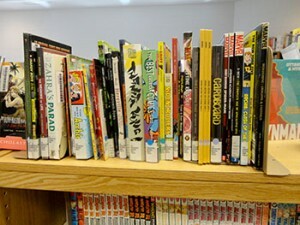 From what I saw of the collection, she has certainly accomplished this – her shelves are full of new titles and all the trendy materials kids want – including magazines, comics, graphic novels, and manga. Patrons come in and are surprised at how much they can find that they like and connect to…and expectations have been raised. “Patrons come here looking for new books that they know aren’t even out yet, because they think we will already have them anyway!” Jill says. Alana and I visited on a summer day.